Posted by Ada Wang on 11/16/2018 4:51:28 PM. Transfer kindle ebooks to another kindle device? Many eBook lovers may have a Kindle, and maybe his/her friends and families also have Kindle devices, so there is a question: How to transfer Kindle eBooks from one Kindle Fire or e-ink Kindle to another kindle device? Because of Amazon's account limitation, people can't transfer ebooks between Kindle devices freely. If you are a regular visitor to our site, you must know a fact: We will always find a way to help solve all kinds of eBook reading problems, no exception with transferring books from one Kindle device to another. If you want to transfer eBooks between two Kindle eReaders (doesn't involve Kindle Fire tablet), or between Kindle and computer, please jump to the easiest method. Step 1: Connect your old Kindle to your computer via USB. You will find your kindle device as a drive under "My Computer", click it and open the drive. Step 2: There should be multiple folders. Open the folders and drag selected files from the Kindle and drop them into the computer's hard drive, transfer ebooks and other documents from the old Kindle to your computer. Step 3: Connect another Kindle to your computer via USB, then there will be a removable disk displaying in your computer, open it and transfer the documents those files copied from your old Kindle to the new one. For audio books please put them in the Kindle's "Audible" directory, and for normal books please place them in the "Documents" directory. All your purchased Kindle books are stored in your account's Kindle Cloud, all you need to do is de-register your Amazon account in the old Kindle then re-register it on the new one. Go to the reading app, all the books you have ever purchased in Amazon Store will show up on your bookshelf. You are allowed to register your Amazon account on several Kindle devices, then your purchased books will not auto-sync to both of your Kindles, but only the later registered one, at the same time, those already downloaded books still remain in your old Kindle. 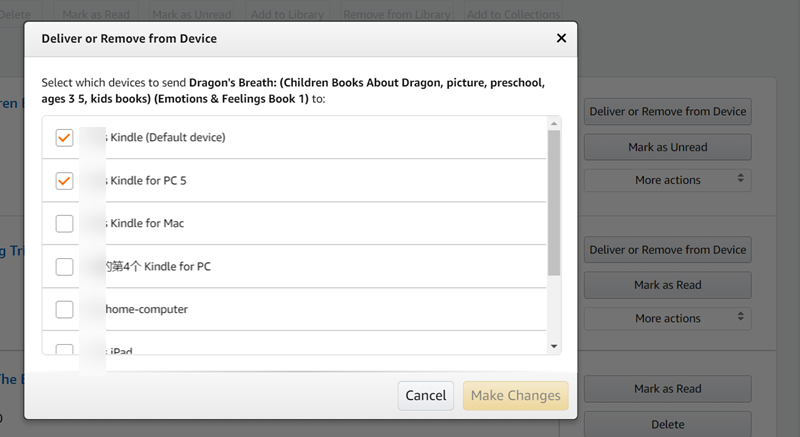 For your newly purchased Amazon books, you can still control which device to sync the item to in the Manage Kindle page. Step 1: Register the second Kindle with the same account registered to the first one. Maybe you purchased a Kindle Touch before then get a new Kindle Fire HD, or your friend or family have got another Kindle and you want to share your purchased book to him/her. Never mind, in one word, it is possible to register your account in another Kindle and won't do much harm on your previous Kindle. After successful registration, please go to Amazon official site then navigate to "Manage Your Content and Devices" (Formerly "Manage your Kindle"). From "Your Content" you will see all your purchased files. Step 2: Click on "Deliver" button. From the new pop up window, you can see all your registered Kindle devices and apps, which means, although you can't auto-sync your purchased books to your old Kindle device anymore, but you can also manually deliver them to any of your registered device. Up by now, you have learnt how to transfer contents from an old Kindle device to a new one; and how to register on two Kindle devices with the same account and transfer purchased contents to them. But what if you are not convenient to share your account with anyone else but only some books? Yes you can lend them out, but you must sacrifice your own 15 reading days, which is not that satisfying. Therefore you need a method to share and transfer your books among unlimited Kindle devices. For DRM free eBooks, you can easily transfer them to other Kindle devices with USB cable freely. You just need to simply plug your Kindle to computer with the USB cable, then there will be a removable disk, open the disk and find the books you want to transfer to other Kindles, then copy them out to your local drive. Now things have been finished with this Kindle. Plug another Kindle on your computer and it will be recognised as a removable disk soon. Paste the books you previously copied out to the current Kindle device. For a Kindle Fire (HD) model, make sure to put the DRM-free Kindle books (mostly MOBI) to "Books" folder. Now you can read those books on another Kindle freely. If you do not want to give your account to other people to login, or do not want to lend your books out. You have to remove your Amazon books' DRM to make them sharable. 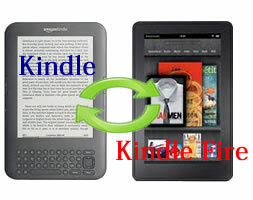 After getting the DRM free Amazon books, you can just transfer them to other Kindles as the above method shows. Tips: If you want to transfer Amazon Kindle books to non-Kindle devices like iPad, Nook, Sony, and other eReaders which don't accept Mobi format, you need to remove the DRM first then convert those books to ePub format, which are suitable for other eReader devices. Recently more and more epubor loyal customers sent emails to ask us like "Does epubor plan to develop a tool to help me transfer Kindle books directly? ", good news is our technicians have developed this tool to meet your demands. Here is our new product, Kindle Transfer. 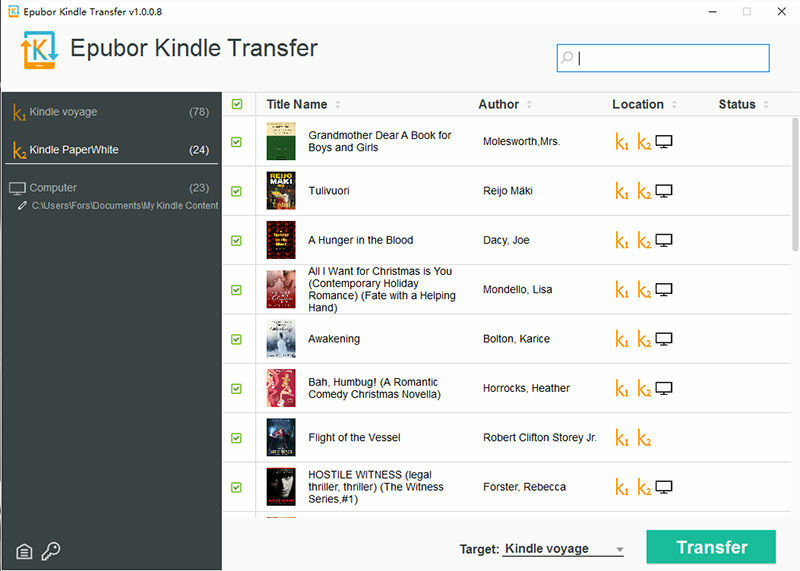 It transfers Kindle books to another Kindle, or to computer, and even to Kobo devices. From the screenshot above, you can easily figure out how to use this software. Connect your two Kindle eReaders to computer. Click on the source device, tick the books you want to transfer. Choose target device in the drop-down menu, then click "Transfer" button. That's all, with 4 easy steps, you can transfer any books from one Kindle to another. By the way, this software can also transfer eBooks between computer and Kindle, you can also try to transfer some EPUB files and check if you can read them on Kindle. Answered all my questions on ebooks on my kindle to my daughters. Thanks. I will recommend you firstly convert your Kindle books to mobi or azw3 format (without drm), then transfer to your another kindle. Or, log in with the same account. Very helpful, I was able to move books from a used Kindle I bought to my new Kindle! This is a new type of shopping. You are worthy it. I have tried unsuccessfully to "deliver" a book in my paperwhite to my other old version (2008) kindle. The book just does not appear. Both are on the same account. The old version (2008) Kindle doesn't support the new format from Paperwhite. Please convert the file to .mobi then try again. My wife has recently bought a kindle device (touch screen) for me and registered on the same account as her old kindle device. I tried all your advice to enable her books to appear in my new kindle, but the minute I switched it all downloaded book have disappeared! I tried to connect it via USB to the computer, but the comp failed to recognise it! Could you please help. i purchased a kindle fire for my granddaughter. I now want to purchase children's story books for her kindle. She lives in another city. How do I purchase the books for her, and send them to her Kindle? Thanks a bunch. Your daughter can sign in with your Amazon account to sync the books and download them. You can also use our software to remove DRM from the books and then directly send the DRM free ebooks to her. Life saver!!! Kindle doesn't have the book I wanted anymore so when I got my new kindle I was upset I had the second book but not the first. Thank you so much know I got the first book again. I am wondering if someone can help me. My parents both have kindle's under the same amazon account but each kindle is registered under their name. My mom bought a book but she sent it to my dad's kindle by mistake. She is asking me how to move it to her kindle and I am not sure how to move the book from one registered kindle to another. Would I just log into their amazon account and go to the manage kindle page and manually transfer that book from my dad's kindle to moms? I assume I can copy the entire "documents" file as is to my kindle # 2? taking both groups of files. Please confirm. Hoping to do all this today, tomorrow at the latest. 4 files, but just one ebook file. You can't read the ebook file on any other devices, it's contains DRM. Why not download the software one this site? download and install Epubor Ultimate then connect your Kindle device to you PC/Mac, the device will show on the software's right side. Remove the DRM at first, then copy the decrypted files to new devices. I bought a Kindle Fire HD 7" about a year and a half ago. I loaded it with hundreds of books. I recently bought a second Kindle Fire HD 7" so that I could leave one at work and not have to take it back and forth. I would like to have ALL of my books on the second kindle but I don't want to go through the 10-at-a-time thing in "manage content" on Amazon. Is there a way that I can put all of my books on the second kindle without losing anything from the first kindle? On your new Kindle, just log in with the same Kindle account, and "Sync". Soon all those purchased Kindle files will be shown on your new device. I have a kindle touch purchased in 2012. It won't switch on although it is fully charged. I have had a quote of $98 to fix it but I may as well get a new one. How can I transfer the books that are on my old kindle to a new one if the old one won't switch on. If so you can only using your new Kindle and then log in with the same Amazon account. Then all you purchased books will be shown in your Kindle Cloud, click books' cover to begin downloading. To transfer Kindle books from one account to another. First of all, you have to download the kindle books to your computer via Kindle for PC. Then run Epubor Ultimate to convert them to MOBI format. Then you can read this guide to transfer the Kindle books to your android device. Epubor software will handle the original book but not including the notes and highlights. Sorry for the inconvenience. You have to be computer wiz to be able to follow the instructions, there are pages and pages of installing and deleting apps, and updating software and it's just way too complicated...especially for Macs. Forget it, I'm out. The developers need to seriously simplify this stuff for those of us who are not computer savvy. What a waste of money. Thank you for using Epubor software and sincerely sorry for the confusion caused. But for now, degrading the kindle app to older version is the best way to remove kindle drm. Also, the newly updated Epubor ultimate will achieve the process automation ( degrading kindle app). So only one click to degrading your Kindle app will be soon added to our software. Please try our software 2 or 3 days later. You do not have to be a computer wiz and removing kindle drm will be more easily.